Each of these free printable spiral hanging ghosts will print out on one piece of paper. Print as many as you wish, cut them out, then hang them up for Halloween. » small vine wreath, two twigs tied in a cross, embroidery hoop, wire clothes hanger, or something similar to hang the ghosts from. Print and cut out as many ghosts as you would like. Suggestion: I printed two ghosts at the actual size of the picture that I drew, then I used my computer to reduce the image size for the third one, so that one of the ghosts is smaller than the other two. You should be able to do the same if you are familiar with changing image sizes on your own computer. If not, don’t worry, because full-size images work well too. Turn each ghost over to the wrong side. You should be able to see the printed eyes showing through from the other side. Trace over the eyes with black marker, so you now have eyes on both sides. Punch a tiny hole at the top of each ghost. Cut a six to eight inch piece of thread for each ghost and thread it through the hole. Tie the ends of the thread together. Choose the support for your mobile. I used a homemade vine wreath, but lots of other things would work instead. Two twigs or dowels tied together in a cross shape would be good for four or more ghosts; a wire coat hanger, embroidery hoop or a disposable foam or paper plate are other possibilities. If necessary, add one or more supporting threads to the top of the mobile. This is what you will use to suspend the mobile from a hook. The amount of threads you need will depend upon the shape of your mobile. My vine wreath needed three thin support strings tied at equal distances around my wreath, then tied together at the top to make a hanger. Tie each of the ghosts to your mobile, keeping them more or less the same distance apart. 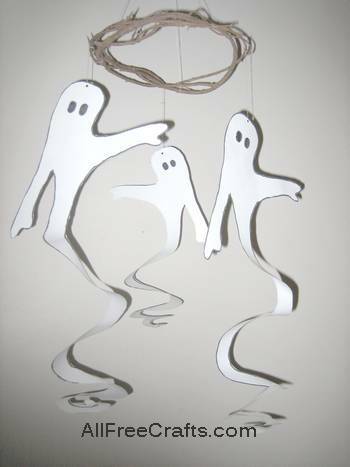 Hang the ghostly mobile from a hook that is high enough to allow the ghosts to flow freely beneath it. If needed, make adjustments to the support threads, or add a little weight such as a small piece of plasticine or play dough so the mobile is evenly balanced. 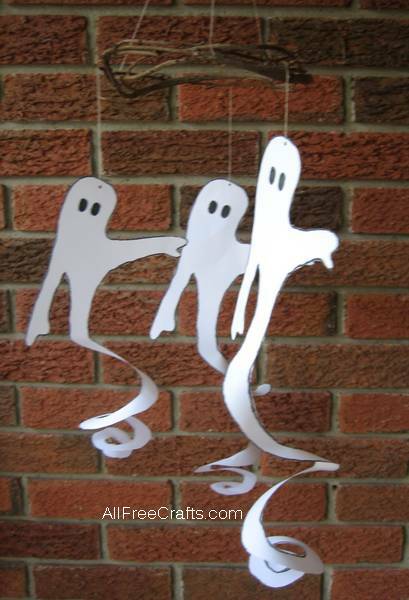 You will find that these paper ghosts are lightweight enough to move with any air flow. They twist and dance in a delightful way. To give each ghost its own personality, you can pull out and twist the spiralling tails in slightly different ways. For instance, try leaving one tail rather tightly wound, but gently pull out another one until it is fully extended. 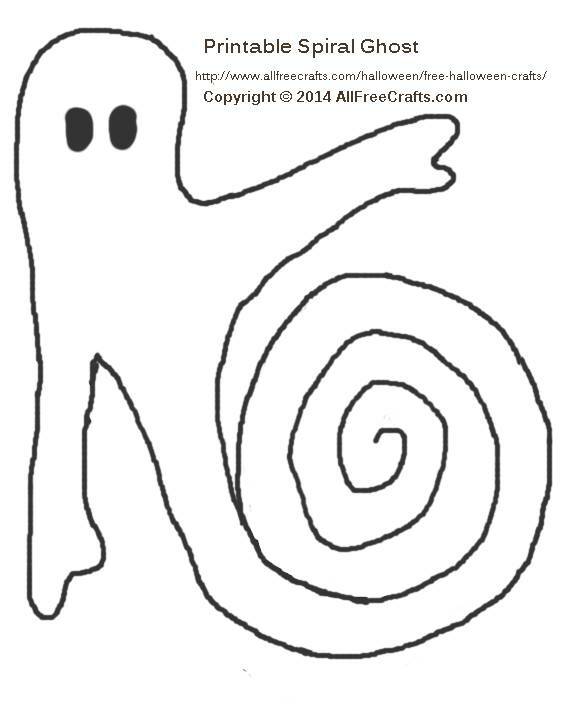 For even more variety, try drawing your own ghost shape with a similar spiral tail.